Publishers can upload documents in a data archive, such as a ZIP file. This means that you can upload multiple documents in one go. If you wish to upload one file document, you can learn how to do so here. Click Upload Data and you’ll be given the option of uploading either directly from your hard drive, or from a URL. 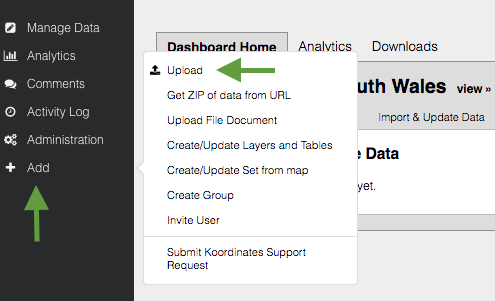 Once your data is uploaded,you will be automatically taken to Import & Update Data, where you will see a list of uploaded datasets. You can also reach this page by selecting Import & Update Data from the dashboard. At this point, you will have the option of creating a document from your uploaded data archive. Simply click Create Document on the import and update page for each file document you wish to import.